Looking for a job can be a lonely business. Often with the stress of bills stacking up while income lags behind, a job search represents a series of micro decisions, each of which requires mental energy. What happens at a job club? Participating in a job club can give your job search structure and connection. Besides getting job leads– the process of sharing your successes, strategizing how to approach job contacts, and getting feedback on your resume, can all make looking for work more meaningful and productive than sorting it out alone. Most job clubs, also called networking groups or job search support groups, have a consistent format: they meet regularly–often once a week; there may be a theme such as working on interview skills; many provide formal presentations and guest speakers; and most provide open discussion time for club members to check in on their progress and ask questions. Job clubs may be sponsored by a wide variety of organizations. Employment-related non-profit organizations often offer a structured job club. American Job Centers in every state of the U.S. frequently offer job clubs or networking group meetings to share leads, contacts, and encouragement. Professional associations and religious organizations are also frequently sponsors of such groups. Who can attend a meeting? Most job clubs are available to the general public, but some target a specific, limited audience. Clubs run by professional associations target professionals in their industry, such as manufacturing, IT, sales, or health care. 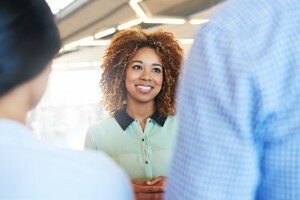 A credential, such as a project management certification, can also be the focus of a networking group, to share leads and professional contacts. Other job clubs are organized around participants’ shared background, such as a military veterans’ job club, youth employment, or religiously-based groups. What can I get from a job club? The type of information available at job clubs also varies. Many help job seekers maintain their financial well-being during a job search; resources may be shared around obtaining low-cost health insurance, paying heat and energy costs, finding housing support, cash assistance, and food shelves. Virtually all job clubs provide information about effective job search methods and may offer instruction on job applications, writing resumes, how to answer interview questions and negotiate a job offer, networking practices, and more. Many job seekers find they are motivated by the support of a job club, but also feel energized by providing that same kind of support to others. During bleak times, reaching out to share a great resource with another job seeker who’s struggling, can be uplifting and remind you that you have something to offer. Use CareerOneStop’s Find a Job Club resource to generate a list of your nearest job clubs. Links will take you directly to organizations’ websites to learn more about the clubs, and to phone number contacts if you prefer to speak with someone who can answer questions.